Synchronous Technology was originally launched in early 2008 and has become an increasingly relevant tool within Solid Edge. More and more users have recognised the productivity benefits it delivers. This Solid Edge ST Migration Training curriculum is perfect for users who have yet to incorporate it into their everyday work practices. This applies to established Solid Edge users working only with traditional (ordered) modelling techniques who now wish to embrace Synchronous Technology, as well as new users currently adopting Solid Edge. There are 22 course sessions, that provide tuition equivalent to a three day classroom training course. To adopt Synchronous Technology successfully users must view modelling workflows from a completely different, and new, perspective. For that reason learning Synchronous Technology does not lend itself to traditional classroom training methods. Users need to reinforce the concepts over a period of time to master the techniques. This is where Solid Mastermind comes into its own. 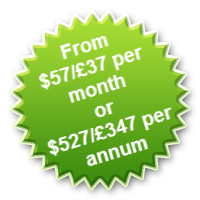 The training is delivered on-line using streaming video tutorials that can be accessed 24/7 from anywhere you can connect to the internet. Each Solid Edge tutorial is enhanced by a downloadable goal sheet and in many cases sample files for you to use in the assignments. To obtain the maximum benefits for you, and your business, Solid Mastermind should be at the heart of both your initial and on-going education. 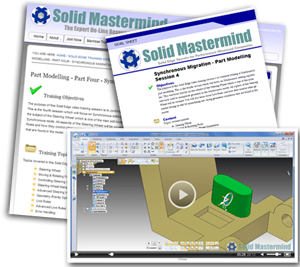 Learning using Solid Mastermind will save you vast amounts of money and help propel your knowledge of Solid Edge to the highest level. This Synchronous Technology Migration course provides you with a comprehensive and efficient education of synchronous workflows, and at minimal cost.